We offer a wide selection pads for hand sanding, including unique pads to convert 5" and 6" paper discs to hand sanding. The price table is at the bottom of this page. 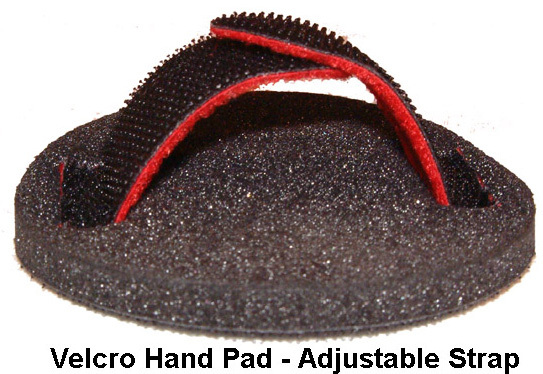 Flexible foam palm hand pads for 5" and 6" diameter discs. Available for both PSA adhesive back and H&L style discs. Excellent for sanding contours. The H&L strap can be adjusted to fit any size hand. Click here or on photo right for larger image. 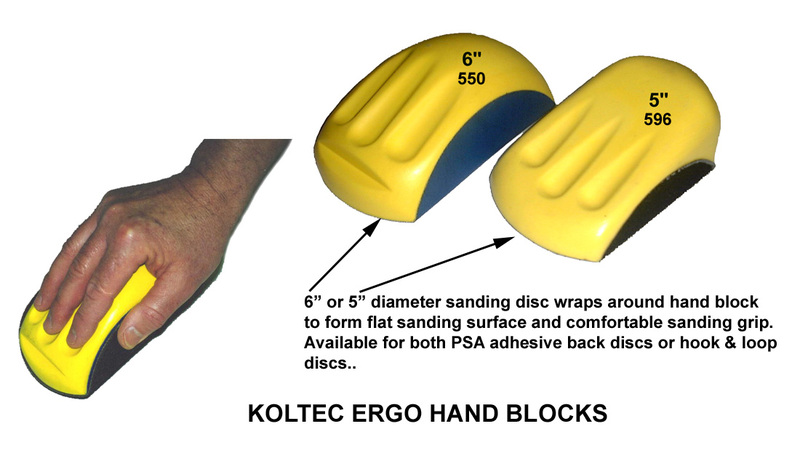 #596 ergo hand blocks for 5" discs. #550 ergo hand blocks for 6" discs. Available for both PSA and Velcro style discs. This pad converts a disc for hand sanding. Ergonomically designed to fit your hand. For sanding discs to use with these hand sanding blocks click here Hook & Loop Discs or PSA Discs. #544 hand block for 2¾" x 5" abrasive sheets. Available for both PSA and Velcro style discs. Click here for PSA rolls to use with these #544 and #545 hand blocks. #545 hand block for 2¾" x 5" abrasive sheets. Available for both PSA and Velcro style discs. #116 hand block for 2¾" x 5" Velcro style abrasive sheets. One side has a soft foam for contours, and the other side is firm for edge sanding.